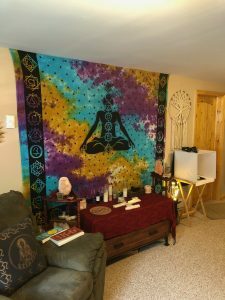 Eventually my business took over that room, first with healing sessions, then with crystal treasure sales, slowly the “sacred space” that was once a whole room became a section I sat in lol but that is ok, I still had “me time”. Fast forward a couple years and now I have a beautiful sacred space/healing room/shop and wow (I don’t like to brag lol) but it is the bomb diggity!!! I created it in one day, (except for things that weren’t shipped to me yet) and my intuition just flowed, I had it set in my mind how it would be and I could not be happier!!! To create a sacred space in your home can help to give your crystal work a special, meaningful, or ceremonial feel. Even if you do not have a room to use on a permanent basis, you can always set up a temporary “space” and take it down when done when you are finished. Now this is YOUR space, you will find that everything you want in there will intuitively fall into place, your happy excited energy will go into it (can’t go wrong there) place your favorite crystals in there, hang those spiritual decorations up, light those candles, turn on those salt lamps, do some grid work, read your cards, practice your pendulum usuage, and just be……. 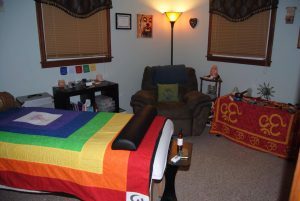 show me your pics of your sacred space!!! !